Newbie bought questionable gear. Where to now? Read the manual - here it is: http://www.jumpshack.com/download/RacerOwnersManualOctober2003.pdf Page 30, step C It's the excess line from the quick loop that's come out of the pilot chute valance. Takes 15 seconds to put it back in. In late 2010, I decided to purchase my own personal Tandem rig. Having put 60 jumps on my new Racer 2K3 Tandem System this past summer, I can confidently say that I made the right choice. It has been difficult for me to verbally explain to others just how impressed I am with this Tandem Rig, and this is why I am writing this article Here are the main reasons why I choose to jump a Racer 2K3 Tandem System: 1. Comfort/Fit 2. Weight 3. Intelligent harness/container design a. Safe Harness b. Smart Rig design, especially the drogue attachment c. Balanced Freefall position 4. Positive extraction of main bag at drogue release 5. Tandem Video made easy a. Balanced Freefall position b. The “right” amount of drag for tandem video 6. Easy to pack 7. Price ABOUT ME I am a small Tandem Instructor. I’m 5’7” and a slim 140lbs. I am a weekend warrior jumper, with a full-time job. 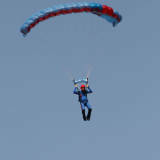 I jump in Canada in the summer months at Gatineau Ottawa Skydive (GO Skydive). I have been in the sport for 10 years, and hold the following CSPA ratings: CSPA D-1046, Coach 2, GCI, JM, SSI, SSE, EJR, Rigger A COMFORT/FIT My Racer 2K3 Tandem was custom-made to fit me. It is not one-size-fits-none, like other DZ tandem rigs made for varying sizes of Tandem Instructors. The Racer fits me well, especially around the shoulders, as the yoke is made to fit me, so I feel contained and comfortably cocooned in the harness and container, not loose and falling out like on a Sigma. The harness is made from one continuous piece of webbing that goes around and around with no extra hardware such as hip rings, chest rings and main lift web adjusters. WEIGHT Put that Sigma rig on the scale, what do you get? I get an average of 55 lbs with my home DZ’s rigs with various reserves and 330 sized mains. My Racer 2K3 Tandem rig (with a 350 main) weighs in at lofty 38 lbs. That is a 13 lb difference, over 30% lighter! It feels like having a student rig on my back, not a heavy Tandem Rig… These two first factors, weight and comfort/fit are beneficial on a busy day. INTELLIGENT HARNESS/CONTAINER DESIGN It has a Racer harness, the same one as the sport rigs. This contributes to both the comfort/fit and the weight savings. The passenger harness is quite comfortable as well, and I only adjust it once. It does not move or loosen in the plane, so there are no last minute harness adjustments, only a quick verification. It also has double tuck-tab riser protection with magnetic riser covers, and total reserve pin protection with the reserve pins being against the Instructor’s back and not exposed on the outside of the rig, but what I really want to talk about the drogue attachment point: Some older tandem systems hung the drogue at the bottom of the container, and this made for a head-low body position during freefall. The Sigma moved the attachment point up to the middle of the main container, making the freefall position a little better, but still in a slightly head-low body position. On the Racer 2K3 Tandem, the drogue is attached in between the main and reserve container, in the middle of the Instructors’ back, making for a perfectly balanced and horizontal freefall position. It is attached using a drogue-riser (an inverted T-bridle) that goes all the way through the container, in the space between the packed main and reserve, and becomes the lower attachment points for the student’s harness. This has 2 main advantages, the first is obvious the first time you jump the system: as soon as the drogue is tossed, the student is pulled into you as the drogue is directly attached to the student’s harness. The second advantage is that there is no stress on the container due to the force of the drogue. On a Sigma, all the load and stress of the drogue is passed through the container’s flaps and sidewalls, and ends up pulling the tandem rig off the Instructors’ back. If you look at a Sigma, you'll notice the deformation both in the air and the resulting stress to the fabric once back on the ground. The drogue bridle is made of webbing, not Kevlar, which makes it easy to cut with a hook knife. Finally, it has double main container protection. A secondary main container pin keeps the main container closed until the drogue is released. As I was taught in my TI course: No drogue=no main. This prevents an out of sequence main deployment. POSITIVE EXTRACTION OF MAIN BAG AT DROGUE RELEASE TIME As a student of parachute design and as a certified Rigger, I’ve learned that a staged deployment of the main canopy is the safest way to deploy a parachute. All sport rigs do it this way, so why don’t all Tandem rigs? The Racer 2K3 Tandem has an ice-cream shaped drogue, which was modeled after a round parachute, and has very little oscillation compared to some other designs. It also has a measured drag of 90 lbs. At pull-time, this 90 lbs of force becomes the system’s pilot chute and pulls the main bag out of the container and gets the main parachute to full line-stretch. This makes for positive extraction of the main bag, just like a regular pilot chute on every other sport system on the market. A Sigma drogue seems to have significantly more drag than the Racer’s drogue. At first this may seem better, but in fact it isn’t, especially at pull time. The Sigma’s drogue is designed to collapse as the as soon as a drogue release handle is pulled. This design “feature” is marketed as making for a softer opening of the main parachute, but in reality, it is a band-aid to address problems with its drogue design: the drogue is too big for the main. I guess the Sigma’s drogue produces so much drag that it makes for some “spirited” openings without collapsing it first, and collapsing is required to save people’s necks and to prevent exploding main parachutes. The problem with this design feature is this: once collapsed, how much drag does that collapsed drogue produce? And secondly, is it enough drag? No one really knows, as it has not been measured…Keep in mind a bagged tandem main weighs about 15 lbs. What I do know is that after looking at hundreds of videos of Sigmas, the main bag is not positively extracted at pull time. The tandem pair falls through the “trap door” as they accelerate because the drogue has just collapsed, and the bag is lazily lifted off the instructors’ back, with the main parachute lines lazily zig-zagging from side to side, not “stretched” straight to line-stretch. It works most of the time. However, it also contributes to all kinds of possible scenarios: off-heading openings, linetwists and bag-locks (the heavy bag spinning around a tight line-stow due to insufficient drogue drag). To summarize, the Sigma has too much drag in freefall and too little drag at pull time… TANDEM VIDEO MADE EASY I have already talked about the balanced freefall position offered by the position of the drogue attachment point, where the freefall position of the tandem pair is horizontal; as opposed to other systems that put the tandem pair in a head-low position. This balanced freefall position makes the external cameraperson’s job easy, getting the paying customer’s face in the shot, as opposed to the top of their head... Secondly, the amount of drogue drag offered in freefall is just right. Being a light Instructor, if I take a sub-100 lb student, even heavy external camera people can keep “up” with me in freefall without the use of massive wings, because my freefall speed is a comfortable 115-120 Mph. EASY TO PACK The main bag is big enough for Tandem mains up to 400 sq ft. The main goes in the bag easily, and you pack it almost exactly like a sport rig, except for the drogue attachment. There is no “grunting” required to pack the system. Everything goes in just so, and without effort. PRICE Lastly, Price. Hey it’s my money, and this is what I bought. The price of a complete new system was approximately $3,500.00 less than a Sigma. I got all custom colors delivered in very little time. The people at Jump Shack are friendly and easy to deal with. And for the record, so are the people at UPT ;) PECULIARITIES First up: RSL. It has a dual-sided RSL, identical to the one on the Racer sport systems. It works, but the user needs to understand it: RTFM! It does not have a MARD system, nor do I think it needs it. Lastly, it incorporates a third drogue release, attached to the cutaway handle. This ensures the proper sequence of emergency procedures with a one-handle pull: it both releases the drogue (if it hasn’t been already) and cuts-away the main. The RSL then initiates the reserve deployment, although pulling silver is still highly recommended. CONCLUSION So there it is. I find there just isn’t much first-hand information out there on this system, and I hope this review can shed some light. I personally think it's somewhat of a hidden gem. I personally know several people that own one or more of these systems, and know of several dropzones in the US, Canada, and overseas that use this rig exclusively. The decision to buy one for myself only came after visiting all 3 major tandem rig manufacturing facilities in Florida in person, and having in-depth discussions with the designers of the various systems. This past winter, I just purchased a second Racer 2k3 Tandem rig so I can better serve my busy dropzone here in Ottawa, Canada on busy days with back-to-back loads. My name is Alain Bard, and I approve of this rig. Since it's so close to my place, it's perfect for my busy schedule. Just show up, hop on a few loads, and i'm back home fast. I don't have to commit my whole weekend. Thanks! Also known as Gatineau-Ottawa Skydive.